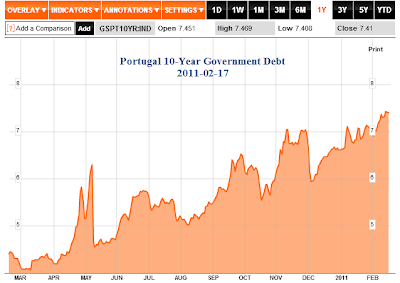 The following chart shows the interest rate for a 10 year government bond in Portugal. The interest rate today hit a new all time record high at 7.41%. Interest rates rise when investors demand a premium due to risk of default. "European Union member states are increasingly concerned about Portugal's ability to fund itself in financial markets and believe Lisbon will have to seek a bailout by April, a euro zone source said on Thursday. The EU has a rescue plan ready for Portugal, but it is dependent on Lisbon asking for the aid and making that request to both the EU and the International Monetary Fund. Portugal remains adamantly opposed to asking for assistance. "Portugal is drowning. It's not going to be able to hold on beyond the end of March," the euro zone source said. As interest rates rise it becomes tougher to finance and roll over new debt. It is like a self-perpetuating death spiral. Greece, Ireland, Portugal, Spain, Italy, Japan, UK, United States. Place your bets and watch the dominoes fall. Silver has launched to new record highs today as it watches and waits for the next bail out provided by a blizzard of printed paper bills.